Growing up sandwiched between two rambunctious brothers didn't leave much room for developing a case of the girly-girl. While I had dolls and Barbies as a young'n, as soon as self-awareness hit me, shortly before I reached double digits in age, my attention was focused on being part of the gang, which consisted primarily of boys. My weekends were rigorously filled with street sports, running around in the vast ravine that bordered our home, or, on rainy days, building fortresses with every single couch cushion we could gather. My fashion consisted of my elder's hand-me-downs, extra large t-shirts (the only way I would wear them), Umbro shorts - the checkered ones (remember those? ), solely sneakers on my feet (pun intended), and pony tails. Using the word tomboy to describe me would be an understatement. What's funny, however, is that when no one was looking, usually on a Saturday morning and strictly indoors, I would parade around in the pretty dresses that still hung in my closet. Nothing made me happier than slipping my tiny feet into my mother's high heels and playing around in her makeup bag. Armed with that red, white and navy blue nautical-inspired polka dot number -- my favorite dress -- and my face painted in the brightest shades of pink, my living room was my oyster and my stairwell my catwalk. But I could never stand the idea of anyone besides my immediate family catching a glimpse of any of it. Being feminine brought me so much shame, for a reason I still can' t quite figure out. Perhaps I thought the boys wouldn't play with me if they viewed me as the opposition and not their comrade? One of my greatest pleasures, however, came from my parents' large shared walk-in closet. My mom kept a few things at the bottom of her dedicated racks; her sewing kit, material swatches for house deco and my personal holy grail: a black leather backpack containing everything from her days as a ballerina. Leotards, tights, those amazing fall-off-the-shoulders knit sweaters, leg warmers, a couple of slippers and pointe shoes. The ritual was blissful: when I was sure to be uninterrupted, I would saunter over to my parents' bedroom, lock the door behind me, retrieve the dance paraphernalia from the closet and put everything on. The pointe shoes were my favorite, as they had beautiful satin laces that wrapped around the ankles so delicately. I made sure to pad the insides with clouds of cotton balls and then proceed to strive my hardest at staying in balance on the very tip of my toes. I was so enamored. Every time my mom told me she gave up ballet, it broke my heart (I was a very sensitive 10 year old). "Why don't you try it?" she would ask me. HELL NO. I could never. It just wasn't me. I have street cred to maintain! Meanwhile, a good friend of mine from school had been in ballet since she was wee little and I would attend every single one of her recitals. But I couldn't bring myself to getting past my boyish nature, that reputation I was so keen to uphold. How is it that public image was such a concern for a child? That I will never know, but because of it I have forever missed the ballerina boat. My obsession has lived on and I have looked to dance for inspiration throughout the years -- it never fails to provide. 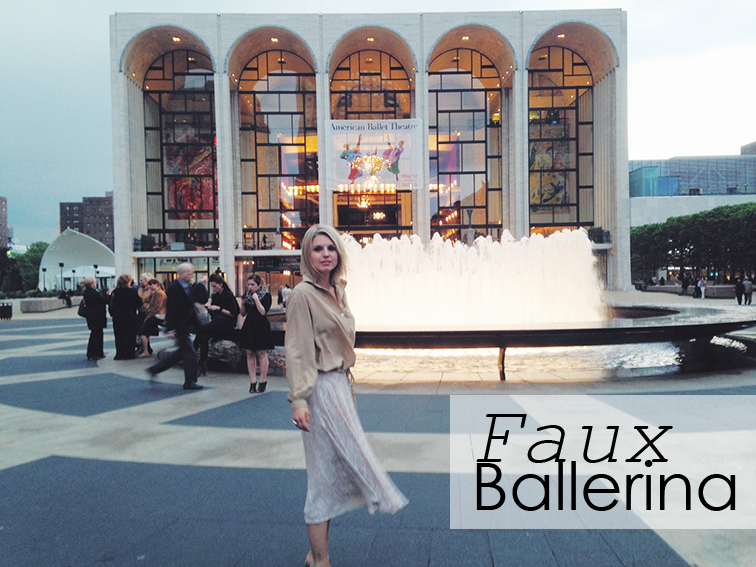 Ballerinas have so much grace, so much elegance, such an effortlessness, they are otherworldly and filled with passion. Their appeal has never left me. 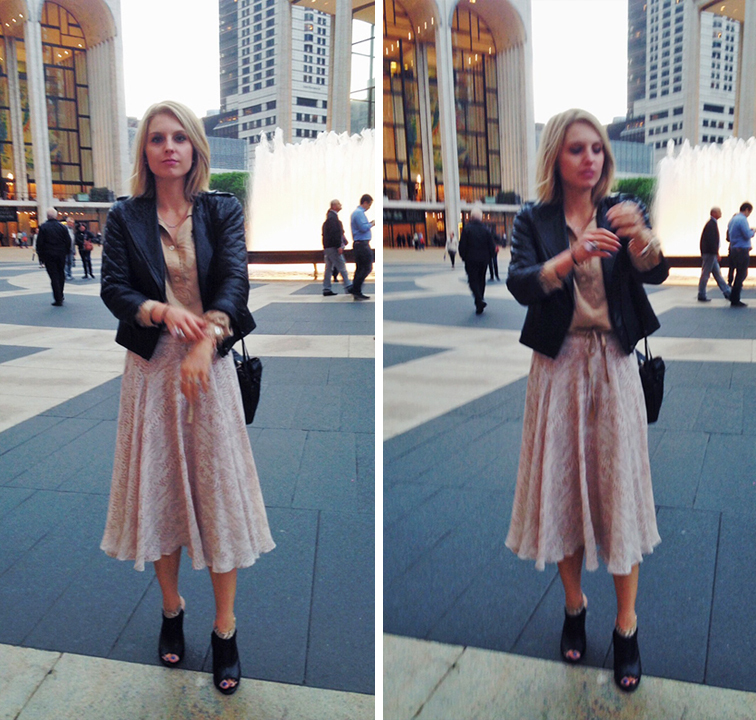 Going to the ballet is always a special affair and my husband took me for my birthday last month. It's especially magical when you're lucky to be attending one in a legendary place like Paris or New York. I wanted to give the art a wink in my sartorial choices that night and this Ann Taylor number furnished the tableau seamlessly. Here's to keeping childhood memories alive (another one, I know!) and to finding your way, in spite of how it all started. 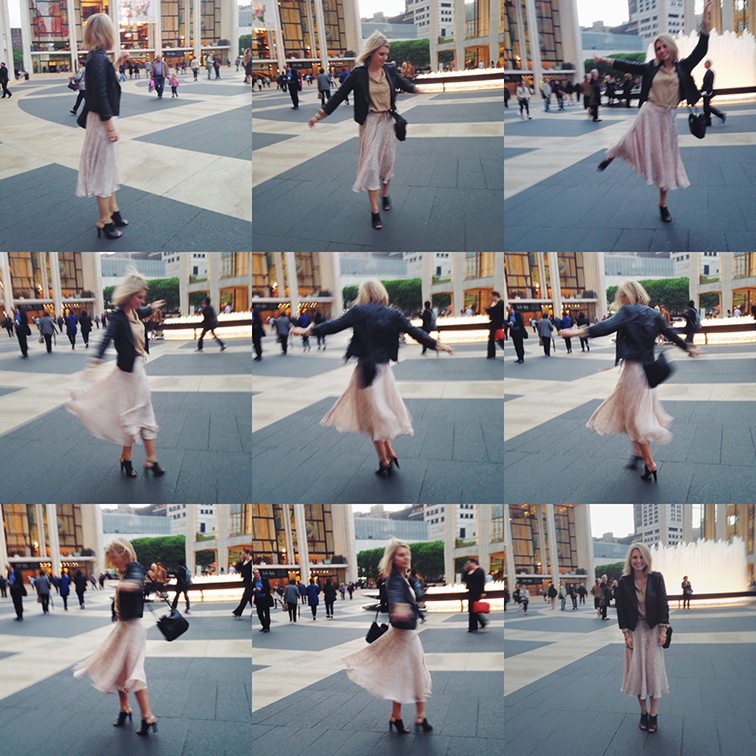 You look so beautiful in these pics, love your skirt! I loved your story! So beautiful. Well you looked amazing. I know you had a fabulous time. I love the ballet! and that skirt is so sweet! You look lovely and so happy! Great shots! You look so beautiful, love the femininity of this outfit. Thanks for your opinion on my last post...hope your week is going well. you looked very pretty doll!! lovely skirt..
You are amazing and joyful, beautiful pictures! I really love those photos.